The need for data access and stability in storage management is a key user requirement, one that determines which storage system will be best suited for your organization. GVS has developed strong feature rich software and hardware management tools to address this specific functionality. GVS also have added features and management tools providing simple and reliable data sharing in an enterprise-level SAN environment. 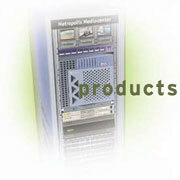 Multiple Metropolis and other servers have access to Nomadic SAN-based data through a single, consistent data image. Sophisticated failover and clustering logic allows load balancing between Metropolis and other servers that reduces recovery time to provide higher availability for mission-critical applications. Online bad block table to maintain record of Nomadic devices' bad sectors so read-write errors may be reduced or prevented. Centralized Nomadic storage for many computers. Heterogeneous Cross-platform storage and data file sharing between many computers running many different operating systems. The use of a single file system for all centralized storage regardless of the operating system mix on client computers. The use of as few as just one LUN for all centralized storage regardless of the number of client computers. High storage reliability through hardware and/or software Nomadic RAID techniques High Metropolis server reliability through file server clustering and fail-over Easy Nomadic storage allocation through normal networking permissions Standard network data security methods. Application launch Log in security integrated settings. These are just a few clear benefit's of investing with GVS Nomadic and Metropolis product line. Rest assured that your investment is with a rock solid company that is here to service your organization into the next millennium.